Knopf Publishing Group, 9780307594037, 352pp. That's the question Will Schwalbe asks his mother, Mary Anne, as they sit in the waiting room of the Memorial Sloan-Kettering Cancer Center. In 2007, Mary Anne returned from a humanitarian trip to Pakistan and Afghanistan suffering from what her doctors believed was a rare type of hepatitis. Months later she was diagnosed with a form of advanced pancreatic cancer, which is almost always fatal, often in six months or less. This is the inspiring true story of a son and his mother, who start a "book club" that brings them together as her life comes to a close. Over the next two years, Will and Mary Anne carry on conversations that are both wide-ranging and deeply personal, prompted by an eclectic array of books and a shared passion for reading. Their list jumps from classic to popular, from poetry to mysteries, from fantastic to spiritual. The issues they discuss include questions of faith and courage as well as everyday topics such as expressing gratitude and learning to listen. Throughout, they are constantly reminded of the power of books to comfort us, astonish us, teach us, and tell us what we need to do with our lives and in the world. Reading isn't the opposite of doing; it's the opposite of dying. Will and Mary Anne share their hopes and concerns with each other--and rediscover their lives--through their favorite books. When they read, they aren't a sick person and a well person, but a mother and a son taking a journey together. The result is a profoundly moving tale of loss that is also a joyful, and often humorous, celebration of life: Will's love letter to his mother, and theirs to the printed page. Will Schwalbe has worked in publishing (most recently as senior vice president and editor in chief of Hyperion Books); digital media, as the founder and CEO of Cookstr.com; and as a journalist, writing for various publications including The New York Times and the South China Morning Post. He is on the boards of Yale University Press and the Kingsborough Community College Foundation. He is the coauthor, with David Shipley, of Send: Why People Email So Badly and How to Do It Better. Does this book have a central theme? What is it? Why does Mary Anne always read a book’s ending first? How does this reflect her character? Early in the book, Will writes, “I wanted to learn more about my mother’s life and the choices she’d made, so I often steered the conversation there. She had an agenda of her own, as she almost always did. It took me some time, and some help, to figure it out.” (page 6) What was Mary Anne’s agenda? Mary Anne underlined a passage in Seventy Verses on Emptiness, which resonated with Will: “Permanent is not; impermanent is not; a self is not; not a self [is not]; clean is not; not clean is not; happy is not; suffering is not.” Why did this strike both of them as significant? What do you think it means? Throughout the book, Will talks about books as symbols and sources of hope. How has reading books served a similar function for you? While reading A Thousand Splendid Suns, Will and Mary Anne discuss three kinds of fateful choices: “the ones characters make knowing that they can never be undone; the ones they make thinking they can but learn they can’t; and the ones they make thinking they can’t and only later come to understand, when it’s too late, when ‘nothing can be undone,’ that they could have.” (page 41) What kind of choices did Mary Anne make during her cancer treatment? Did she or Will make any of the third type? Mary Anne especially liked a passage from Gilead by Marilynne Robinson: “When you encounter another person, when you have dealings with anyone at all, it is as if a question is being put to you. So you must think, What is the Lord asking of me in this moment, in this situation?” (page 96) Why do you think this moved her so much? What did it mean to Will? How does religious belief help Mary Anne? How do you think it might have helped Will? Mary Anne doesn’t believe her travels to war-torn countries were brave: “I wanted to go to all those places, so how could that be brave? The people I’m talking about, they did things they didn’t want to do because they felt they had to, or because they thought it was the right thing to do.” (page 167) In what ways is Mary Anne brave during her cancer treatments? Does she ever come to think of herself as brave? Will is amazed by his mother’s ability to continue her efforts to fund the library in Afghanistan even while facing a death sentence, until he realizes that “she used her emotions to motivate her and help her concentrate. The emphasis for her was always on doing what needed to be done. I had to learn this lesson while she was still there to teach me.” (page 194) Did Will learn? What makes you think so? Why did Mary Anne become so intent on certain things happening: Obama’s election, David Rohde’s safe return? Will talks about his own “magical thinking” several times in the book—what form do you think Mary Anne’s took? 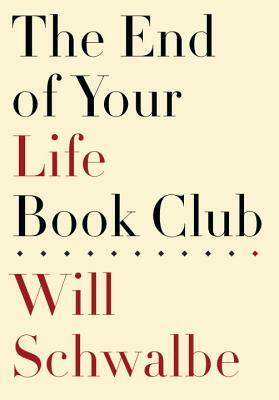 “We’re all in the end-of-our-life book club, whether we acknowledge it or not; each book we read may well be the last, each conversation the final one.” (page 281) How did this realization affect Will’s final days with his mom? After she dies, Will looks at Mary Anne’s copy of Daily Strength for Daily Needs, next to the bed. He believes this quote from John Ruskin was the last thing his mother ever read: “If you do not wish for His kingdom, don’t pray for it. But if you do, you must do more than pray for it; you must work for it.” (page 321) How did Mary Anne work for it throughout her life? Do you think Will found solace in this passage? Several times in the book, Will talks about eBooks versus their physical counterparts. Why does he prefer one to the other? Does Mary Anne agree? If you read this book on an eReader, how do you think it affected your experience? Which of the books discussed by Will and Mary Anne have you read? Which do you most want to read?